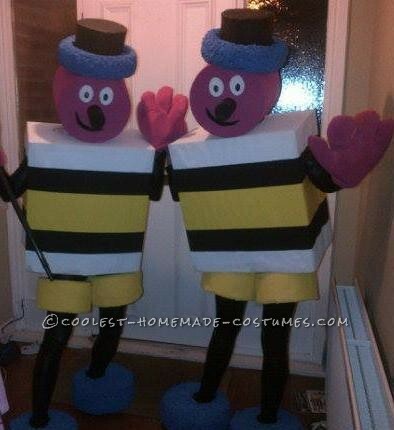 My friend and I decided to make Bertie Bassett costumes after the licorice all sort sweets. We thought it would be more impressive to have two rather than just one. It took about four weeks to make the costumes and lots of things went wrong but we got there in the end. The heads are made out of lampshades put on their side with a whole cut out for the head to go through. I sealed up the ends of the lampshade with cardboard and cut out eyes and a mouth and added a toilet roll tube for the nose. A couple of layers of paper mache were added to the heads to make them more sturdy. We wanted to get each piece the same sort of texture as the sweet, so we covered the heads in white felt to give it a coconut texture, then painted them. The hat is made out of cardboard and a polystyrene ring which I carved a little bit out of to allow it to sit on the head. 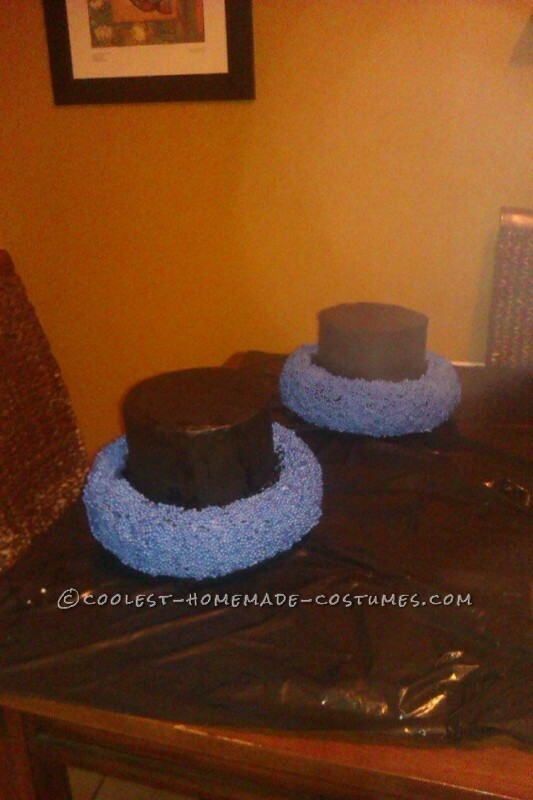 Polystyrene beads were added to the base of the hat to again look like the texture of the sweet. The same was repeated for the feet which were cardboard also, open at the bottom with a sock sewn in so we could just pull them on without too much touching and slip on our shoes. The hat and feet were also given a few layers of paper mache. The polystyrene beads were an absolute nightmare to work with, it was so hard to get them to stick and required lots of PVA glue and in the end spray adhesive but I did have the problem of using the wrong kind of glue in the first place which melted the polystyrene, so it’s important to make sure it doesn’t contain a solvent. When I eventually got them to stick, they started coming away with the paint brush when I tried to paint them. I would not use this method again, there were many a night of despair over this. The bodies are made of cardboard and duct tape, covered in smooth paper and painted. The parts for the legs were plastic sweet containers with the bottom cut out. 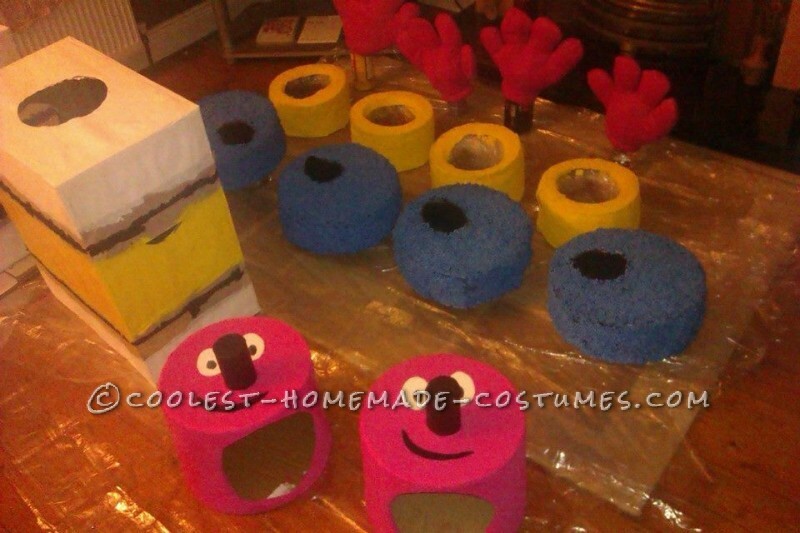 These were wrapped in bubble wrap for comfort and to bulk them out, and then covered in felt and painted. We both wore a long sleeve black wet look top and leggings to look like licorice. This costume was a lot of work but we are so pleased by how they turned out. We went out for to a night club on Halloween night, we had to get two taxis, one for us and one for the costumes and we got dressed on the side of the street beside a hotel. We got an amazing reaction, it was like we were celebrities, guests from the hotel were getting their picture taken with us and the same was true when we got inside the club. We weren’t able to move very much as the place was so crowded but we were finalists in the competition, unfortunately we didn’t win, as we were beaten by a fridge. :( He had more friends with him and they cheered the loudest.